One is loathe to add the chorus of attacks on Woody Allen. 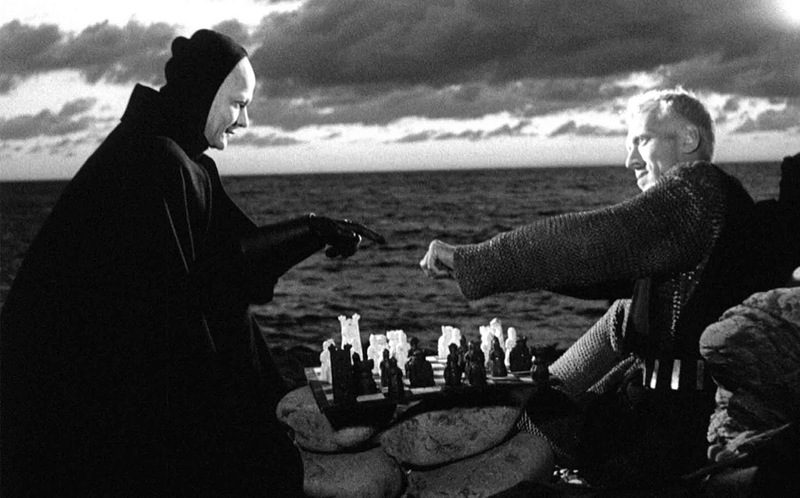 Don’t hit a man when he’s down, but his New Yorker parody “Death Knocks” actually did a huge disserve to the extent that it diminishes Ingmar Bergman’s The Seventh Seal (1957), which is currently being revived at Film Forum, as part of a Bergman retrospective. Seeing the film over 60 years from its original release, it’s hard not to regard it as a classic treatise on the medieval world in its mixture of the sacred and profane, in its grotesquery and humor and in the ongoing scholastic dialogue between the Knight Antonius Block (Max Von Sydow) a former pilgrim, who wrestles with belief and asks, “why can’t I kill God in me?” and his side kick Jons, (Gunnar Bjonstrand), the realist who refuses to admit the presence of the unknowable even when it stares him in the face. 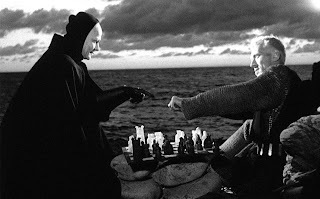 It is the Knight who challenges Death (Bengt Ekerot) in chess, the film's famous leitmotif that Allen turned to gin rummy. Flagellants, jesters, witches burning at the stake and the plague are all part of the parade which is a dark version of the Fellini circus. Of course the movie is also a metaphor for contemporary life. “This bloody talk of doom," Jons remarks. "Is that sustenance for a modern man?” Death is everywhere. “A skull is more interesting than a naked wench” says one character and doubters and believers are united in the their struggle to find agency in the face of inexplicability.